Download 3 arrows PowerPoint templates and visualize your ideas, concepts in the most eye-catching way. You may have various assumptions for a given situation; you can highlight each using our 3 arrows PowerPoint template, which will ease in the formulation of the result. Whatever your approach may be, but after great discussion and deliberation, it has to be effectively conveyed to colleagues, team members, and the audience. Our collection of 3 arrows PowerPoint templates are ideal for featuring three different scenes which can be highlighted using three different directional arrows. 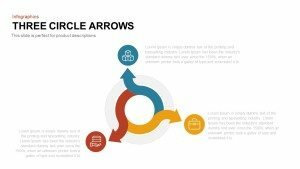 Our collection of 3 Arrows PowerPoint templates includes the most versatile designs. You may have a need for curved arrows, straight arrows, cylindrical arrows we have all you need in our library. Our multi-directional arrow diagram assists you to depict the approach that has to be selected conveniently. The astonishing design, pleasing color palette, clipart’s will bring your content into the limelight. Our collection of 3 arrows diagram includes premium, as well as free templates, opt for the best slides and you are ready to craft a fantastic presentation.